The sustainability policies and recent practices of 10 largest IDX-listed palm oil growers were analyzed and ranked. Together these companies harvest around 10 percent of the world’s oil palm. Climate change, biodiversity loss and human rights abuses were the key elements of screening. 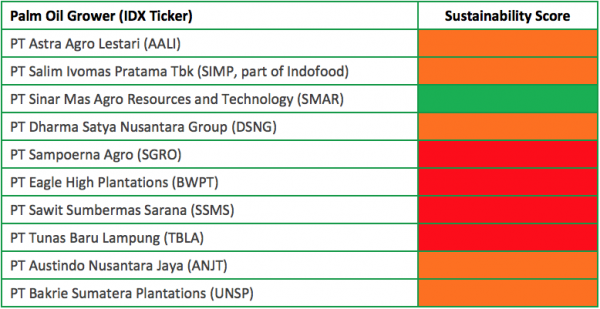 The sustainable purchasing policies of main traders/processors have strengthened the sustainability policies and practices of 4 of the 10 largest palm oil growers listed on the Indonesian stock exchange (IDX). Most of the IDX-listed palm oil growers still have poor sustainability standards. The IDX-listed palm oil growing companies PT Tunas Baru Lampung and PT Sawit Sumbermas Sarana are presently clearing forests and/or peatlands. The world’s top food processing companies Nestlé and Unilever are among their customers. The scores were transferred into the categories red (policies and practices inadequate), orange (should be improved), and green (likely not perfect, yet on the way). Figure 1 below shows the final scores (largest palm oil growers mentioned first). Figure 1: IDX-listed palm oil growers, sustainability scores. All ten companies reviewed for this analysis experienced severe harvest reductions in 2016, compared to 2015. The lower harvest figures, up to 30 percent, were caused by the severe drought and catastrophic haze in July to October 2015. The drought was accelerated by climate change. The haze made Indonesia one of the largest GHG emitters globally in 2015. In early November 2015, President Widodo issued a presidential instruction ordering companies to stop developing new palm oil plantations on the fire prone peatlands. On December 5, 2016 the protection of peatlands became law. However, of the 10 largest IDX-listed palm oil growers, five (SGRO, BWPT, SSMS, TBLA and UNSP) have yet to publicly commit to ending peatland development. Among them, TBLA was found to continue peatland development in 2016, and SSMS plans to do so within one of its recent greenfield acquisitions. Only a few of the 10 largest IDX-listed palm oil growers specifically refer to global principles for social issues, such as the right of local communities to Free, Prior and Informed Consent (FPIC), the core conventions of the International Labour Organisation (ILO) and the United Nations Guiding Principles on Business and Human Rights. Two companies are presently subject to severe legal and/or government screening related to environmental issues. On August 11, 2016 judges of the South Jakarta District Court ordered SGRO to pay more than $80 million for compensation and environmental restoration. TBLA did not comply with the terms of a permit granted by Indonesia’s Environment and Forestry Ministry in 2012. Since June 2015, the market force from the NDPE-policies by main traders/processors has led to the strengthening of sustainability policies and practices by 4 of the 10 largest IDX-listed palm oil growers. Two IDX-listed growers (AALI, DSNG) issued stronger sustainability policies, and another two (BWPT, ANJT) suspended their operations in contested areas after buyers’ intervention. In June 2015, Chain Reaction Research estimated that six out of the 10 largest IDX-listed growers had a high-risk exposure (chance of losing main buyers) due to the sustainability standards of their buyers. Our new estimate is that four out of the 10 companies have a high-risk exposure: SGRO, TBLA, BWPT, and UNSP. PT Tunas Baru Lampung (TBLA) and PT Sawit Sumbermas Sarana (SSMS) are presently clearing forests and/or peatlands. The main NDPE-buyers of SSMS in 2016 were Louis Dreyfus and Unilever. The main NDPE-buyers of TBLA were Nestlé, Louis Dreyfus, Musim Mas, Wilmar, GAR, ADM, and Asian Agri/Apical.